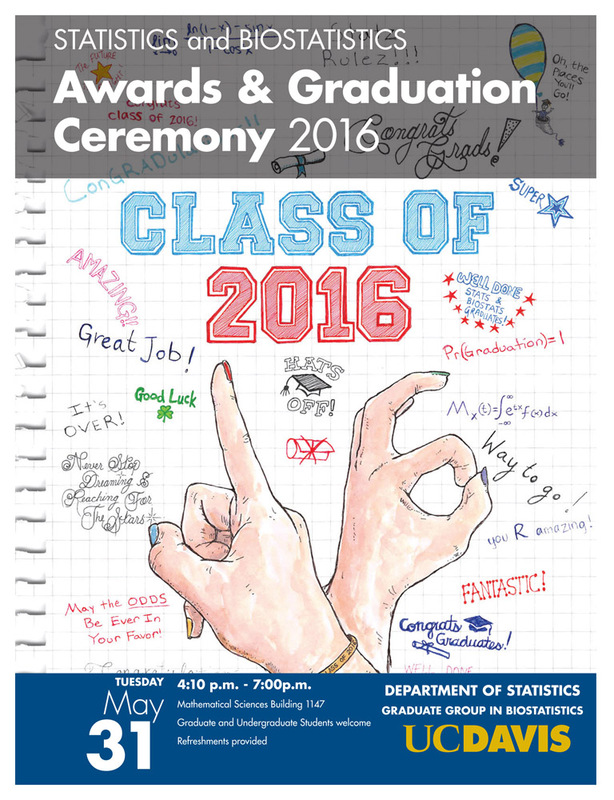 The UC Davis Department of Statistics invites Statistics and Biostatistics undergraduate and graduate students, faculty and staff to join us for our annual Awards and Graduation Ceremony. We will be honoring all of those students who have received (or will be receiving) degrees in Statistics or Biostatistics during 2015-16, as well as those who are receiving Departmental Citations and other honors. We will also announce the winners of this year's various graduate student awards, such as the Julius Blum Award and the Peter Hall Graduate Research Award. Students being honored are welcome to invite their families to share the occasion. The Ceremony will be held on Tuesday May 31, from 4:10pm until 7:00pm, in the Colloquium Room MSB 1147. If you will attend this event (particularly if you will bring guests), please let us know by completing this following Google form. For more information, please email: Kim McMullen (kimcmullen@ucdavis.edu) for undergraduates, Kate Tape (ktape@ucdavis.edu) for Master's students, or Pete Scully (pscully@ucdavis.edu) for PhD students.